Portions of the IU School Medicine site are featuring a fresh new look with updated content. New pages featuring all nine statewide campuses as well as aspects of the school's education and research mission now provide site visitors a more integrated and modern digital experience. With bold images of school faculty and students, the new website also conveys a collaborative working and learning environment at IU School of Medicine. Take a look at medicine.iu.edu. The new pages represent the first phase of a rebuild that will occur over the next several months; the entire site will be migrated to the new platform by late spring. Until the full migration is complete, the website will feature both new pages and legacy site pages. As the school's departments, centers and other entities are rolled into the platform, user feedback and analytics will further improve design features and performance. To request updates or provide feedback on the new pages of the school website, please complete the form available on the website page of MedNet. For updates to pages on the legacy site pages, please contact your team’s web lead. Responsive: For the first time, the IU School of Medicine website is built to respond to our users' preferred way to receive information - whether that is on desktop, tablet or mobile devices. Optimized: In the coming months, IU School of Medicine's visibility on search engine result pages will improve as our site becomes increasingly better positioned for user search queries on Google and other search engines. Tracking Metrics: With analytics implemented throughout the site, we will soon have actionable data to better understand how users engage with our site so we can better meet their needs and meet our objectives. Accessible: The new site is built according to accessibility standards set by the digital communications industry to ensure that all audiences can perceive, understand, navigate and interact with us online. User-focused: The new site features all new content that's organized by topic instead of internal reporting structures to ensure we're emphasizing the school's work, offerings and expertise in a relevant and accurate way for target audiences. This sets the stage for meaningful cross-departmental promotional campaigns. Branded: Progress toward a consistent, modern brand design for the school reflects its excellence and conveys important attributes that motivate our audiences to engage with us. The new site also aligns with the new digital design recently implemented by Indiana University, putting the school in compliance with university-wide branding standards. For the past two months, Maureen Harrington, PhD, associate dean, medical student education in foundational sciences, has traveled to IU School of Medicine campuses across the state speaking with MS 1 and MS 2 students about the new Phase 1 and Legacy curricula. Muncie students will have a chance to provide feedback at 5:30 pm, Wednesday, Nov. 30. The open platform session will be held in E.F. Ball Med Ed Building, Room 226, 221 N. Celia Ave., in Muncie. In observance of the Thanksgiving holiday, InScope will not be published on Thursday, Nov. 24. The next issue will be distributed on Thursday, Dec. 1. The final issue of 2016 will be published on Dec. 15 with distribution resuming in the new year on Thursday, Jan. 5. News items for upcoming issues should be submitted to scopemed@iu.edu. Based on student suggestions for IU School of Medicine apparel options, new items have been added to the IU Official Custom Shop. Customizable zipped hoodies, in two different options, are now available. The hoodies are offered in three colors--white, gray and charcoal gray. The IU School of Medicine apparel store, launched this spring, features a variety of items for all seasons of wear. To suggest an item for the Custom Shop, send a quick note to iusm@indiana.edu. Samia Hasan, MD, of IUPUI Campus Health, is a designated psychiatrist available to consult with IU School of Medicine medical students and residents as part of the school’s commitment to learner well-being. While Dr. Hasan can provide services to learners from all campuses, initial evaluation appointments (60-90 minutes) need to be completed in person on the Indianapolis campus where she is located. To help accommodate all learners, those from regional campuses outside Indianapolis will be given priority for initial evaluations scheduled on Connections Days. Subsequent appointments (25 minutes) can be completed by phone. There is no cost for Dr. Hasan’s services, and medical records are kept strictly confidential and maintained within IUPUI Campus Health. Learners may contact Dr. Hasan directly by email at hasans@iu.edu or phone at (317) 274-1068. Confidential information should not be included in email, but can be left on voicemail. “Connections to Empower. Knowledge to Succeed” is the Mentoring and Advising Program (MAP) tagline recently selected by IU School of Medicine students through a statewide submission and voting process. Challenged to suggest a tagline encompassing MAP’s objectives of academic advising and career mentoring, students submitted entries over a three-week period and then voted on their favorite tagline from those entries. Fourth-year students Sid Dasari, Lindsay Leech, Annie Oesterling, Kody Thompson and Sam Wilhite submitted the winning tagline. Thank you to these students for their creative submission and to all students who voted and sent in tagline suggestions. Appreciation is also extended to the Ruth Lilly Medical Library and the IU School of Medicine Office of Student Affairs for donating swag to the submission winners. Graduate students interested in translational research have until Monday, Dec. 12, to submit applications for the Indiana Clinical and Translational Sciences Institute (CTSI) predoctoral training awards. Eligible translational research may involve applying discoveries made during work in a lab, developing clinical trials and studies in humans, or carrying out research aimed at enhancing best practices. Candidates must have completed at least one year of a predoctoral training program, but cannot have completed more than their third year. Funding is for two years. Benefits include a stipend, as well as health insurance and partial coverage of tuition and fees. Awards will start July 1. Interested candidates must be prescreened for eligibility by submitting copies of their CVs to Colleen Gabauer at ictsi@purdue.edu. More information is available at indianactsi.org. The application deadline for the IU School of Medicine Biomedical Research Grant and the Research Enhancement Grant are due by 5 pm, Tuesday, Jan. 10. Investigators desiring administrative review of the application components to ensure compliance with posted submission guidelines must submit the proposal to iusmoper@iu.edu at least five business days before the Jan. 10 deadline. If an application is not received five business days prior to the deadline, it is assumed the principal investigator has waived administrative review rights. In this case, the proposal should be uploaded directly to the CTSI website and may be subject to administrative withdrawal if not compliant with guidelines. For application forms and further information, visit the Research Administration Sharepoint site. Applications are being accepted for grant awards from the Ralph W. and Grace M. Showalter Research Trust. The areas of eligible biomedical research are broad and described by the benefactors as “the type of medical research that is most likely to permanently benefit mankind.” Donor intent prohibits the use of Showalter Trust funds for research in psychiatry, sociology or social studies. Applications for funding will be reviewed in two stages. First, the IU School of Medicine Biomedical Research Committee will select the most meritorious proposals for further discussion and ranking. The committee will then provide a recommended ranking to the Showalter trustees who conduct a second review. Final funding decisions are made by the Showalter trustees. An electronic version of the application for Showalter funding must be fully routed using the IU Kuali Coeus (KC) system by 5 pm, Tuesday, Jan. 10. (For submission purposes, the agency deadline should be listed as Jan. 17.) The Office of Research Administration (ORA) will review applications and contact the principal investigator (PI) if any revisions are needed. The PI will receive the signed application from ORA which then needs to be uploaded to the Indiana CTSI website at indianactsi.org. For more details, visit the Showalter Sharepoint site. Mark your calendar for IUPUI RESPECT Center’s 2017 conference, “Let’s Talk Palliative Care: Challenges, Controversies, and the Cutting Edge,” on Friday, March 3, at Ritz Charles, in Carmel, Indiana. Keynote speaker is Angelo Volandes, MD, Harvard Medical School. Poster abstract submissions will be accepted through Jan. 20. For details, view the call for poster abstracts. Nadia Nguyen Adams, MHA, chief operating officer of Indiana University Center for Health Innovation and Implementation Science, and network director of Great Lakes Practice Transformation Network, has been recognized as a 2016 Women of Influence honoree by the Indianapolis Business Journal. IU Center for Health Innovation and Implementation Science employs the tools of implementation science in support of the goals of safely and effectively translating innovative discoveries into new therapies. The Great Lakes Network, a project of the center, seeks to improve health outcomes for at least 10 million patients, reduce unnecessary hospitalizations and generate at least $1 billion in cost savings to payers. Adams joined IU Center for Health Innovation and Implementation Science, which is part of IU School of Medicine and Indiana Clinical Translational Sciences Institute, at its inception in 2013 as executive director and became chief operating officer in 2015. Educating and inspiring future physicians is the goal of IU Mini Medical School, sponsored by Indiana University School of Medicine, Methodist Health Foundation, IPS Education Foundation and ScienTech. The event will be held from 8 am-2 pm, Friday, Dec. 2, at the Fairbanks Hall Simulation Center and the Health Information and Translational Sciences Building (HITS). Offered to 60 students from IPS’ Crispus Attucks High School and Shortridge High School, IU Mini Medical School provides students the opportunity to listen and speak with IU School of Medicine physicians, learn from prominent members of the medical field, gain hands-on medical field learning and benefit from mentoring sessions with current IU medical students. Thomas A. McAllister, MD, chair of the Department of Psychiatry and a nationally recognized expert on concussions, will be the keynote speaker for the event. Richard Gunderman, MD, PhD, professor of radiology and imaging sciences, will also speak. 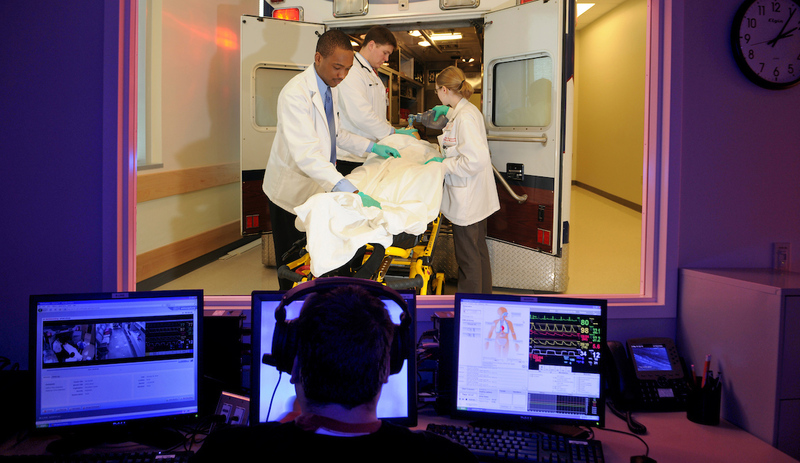 During the event, students will participate in hands-on activities in the Simulation Center.